It's that time of year when noses are running, throats are scratching, and sinuses are under pressure. Drugs (prescription & over-the-counter) are not always the answer! That's why I was excited to try the OCEAN Nasal Care products! They sell non-medicated nasal products to help you and your family breathe better . . . naturally. I'm not the type of person that likes to run to the doctor the second illness strikes. I prefer to take the natural approach and try to cure small illnesses naturally. 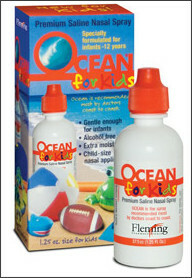 My son was recently congested and I knew immediately that it was time to try the Ocean for Kids Saline Nasal Spray. I like that it's even safe enough for newborns. Although squirting the saline mixture into each nostril was not his favorite thing in the world, I do believe that it really helped to clear him up. I just did it real quick while he was laying down & I was changing his diaper. 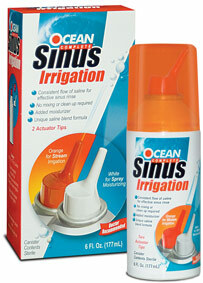 Next to try was the OCEAN Complete which is a sinus irrigation set. It is so user friendly and with detailed instructions included, it's not intimidating at all! The set comes with a tip for just moisturizing, which is like a refreshing mist perfect for irritated dry nostrils. The other tip is for irrigation but also comes with a comfort piece. After two 3-second pumps in the morning, I was decongested and my sinus pressure was much better!! You can find OCEAN products at your local stores, such as Harris Teeter, Kroger, Walgreens and more. Go here to find out where they're sold near you! Onto the GIVEAWAY . . . One lucky winner will get the chance to try out these three OCEAN products: the OCEAN Complete, OCEAN Premium Nasal Spray, & the OCEAN for Kids! For extra entries (1 extra entry for each) be sure to . . . The Fine Details: This giveaway will end on February 17,2011 . The winner will be notified by email and has 48 hours to respond or another winner will be chosen. The winner will be chosen by random via random.org.